It is with much concern that I bring forward another appeal for relief in support our friends, neighbors and brothers in OUR Grand Jurisdiction. Our Grand Lodge requested an official appeal for Masonic Relief from the Masonic Service Association of North America on behalf of the Grand Lodge of South Carolina and it was approved for distribution this week. Thankfully, most of our Lodges and members in South Carolina have been truly blessed with the passing of Florence with minimal reports of damage, but the aftermath and heavy flooding of the Pee Dee river basin, the Waccamaw River, Great and Little Pee Dee, Lumbar, Lynches, and Black Rivers are all exceeding flood stage. All the flood waters are heading to Winyah Bay in Georgetown. We are continuing to assess our Lodges and member needs and are getting reports of Lodge flooding, members home flooding and thousands being impacted now by rising flood waters. Thanks be to Almighty God for the blessings we have received in South Carolina but we will have needs that we can help! Unfortunately, almost 2 weeks after landfall of Hurricane Florence, the impact continues in South Carolina. As you know, communication is slowly being recovered, with utilities impacted by flooding which has limited repairs being completed quickly and I expect that we will have issues for weeks and months to come. 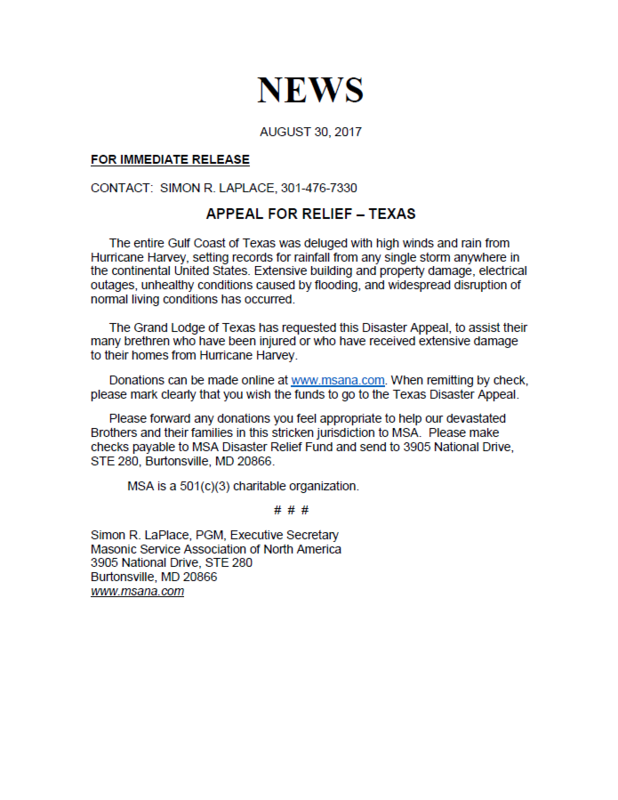 Our Jurisdiction is well known for our quick response to appeals from our brethren, and now as we have a request from North Carolina, we need to assist our own. I ask for your support again my brethren. Once again, we have an opportunity to aid and assist our brethren. Again, I am asking Lodges and Districts to contribute by one of the following methods, passing the hat specifically for Disaster Relief, direct vote to contribute, appeal letter to your members, or a community fund raising event with all proceeds to go to Hurricane Disaster Relief. Your support will be 100% in support of the Disaster Relief. 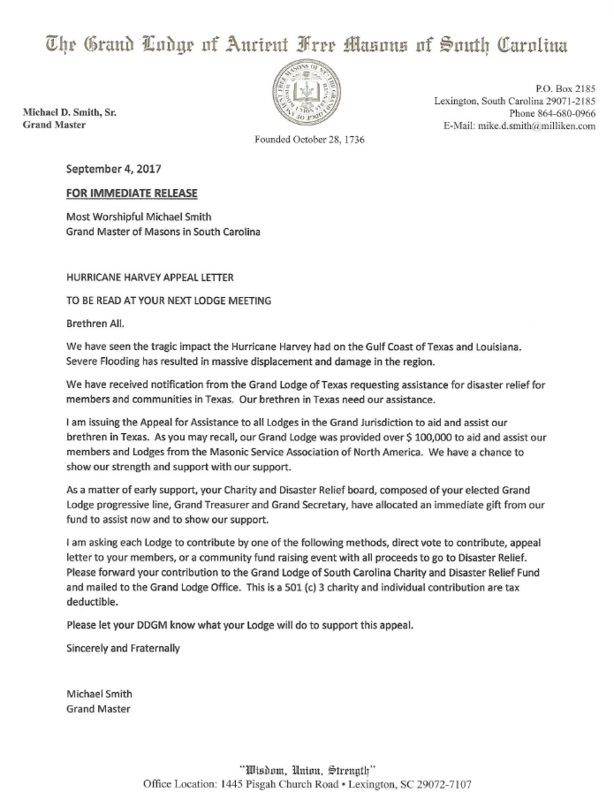 Please forward your contribution to the Grand Lodge of South Carolina Charity and Disaster Relief Fund and mailed to the Grand Lodge Office. This is a 501 (c) 3 charity and individual contribution are tax deductible. Stand Tall for Freemasonry, Stand Tall for our brethren and families. Band of Brothers The officers of a Lodge have been elected or appointed to serve the Lodge because of their particular talents. Some are more gifted in certain areas than others, but all of them must possess one very important characteristic, that of DEVOTION TO DUTY. When our Brother accepts an office in our Lodge, he is affirming to the Brethren he has committed himself to Masonry and to the complete success in his office. Additionally, when a Brother joins our Lodge, it is a twofold commitment as he unites with his Band of Brothers. There is a great deal of planning, studying, and attending involved in each of these offices and each officer will need the support of everyone. When we are not prepared to make these sacrifices and prioritize, we are not being just to our Band of Brothers by accepting the office. If you do not have the support of your family and are willing to place GOD first, family second, your chosen vocation third and the Lodge fourth, then you should have never taken the responsibility of a Lodge Officer. Every officer must work with enthusiasm, not only at his own particular job in the Lodge, but he must assist each officer in the performance of their duties. In the performance of duty, the officer demonstrates a desire to ascend to the next office in line or to some other position of responsibility in the long line of service. A successful Lodge is united through a good educational program, good Lodge administration and management, a good mentoring program, a good community outreach program, and good Ritual. It is the responsibility of every officer to ensure your Lodge is a Band of Brothers. Decorum in our Lodge was established by our Founding Fathers. They wanted to institute a culture grounded in unity and decorum creating place for our families to gather and a quality experience for the aspirant. They were convinced of the need to be distinctive in terms of quality rather than opaque. As we think about the year 2018 with the challenges, hopes and dreams awaiting, we must not find ourselves looking back. We must remain united as a Band of Brothers who meet on the level. A portion of the charge we administer to each Senior Warden is very poignant-- “The LEVEL demonstrates that we are descended from the same stock, partake of the same nature, and share the same hope; and, though distinctions among men are necessary to preserve subordination, yet no eminence of station should make us forget that we are Brethren.” It is interesting how our mind recalls a song, poem or a particular place we identify with which corresponds to a time in our lives. Poetry was never one of my strong suits, however certain stanzas from a poem by Alfred Lord Tennyson does permeate my thoughts as I reflect on our Band of Brothers. ​Though much is taken, much abides; and though We are not now that strength which in old days Moved earth and heaven; that which we are, we are; One equal temper of heroic hearts, Made weak by time and fate, but strong in will To strive, to seek, to find, and not to yield. ​MWB Michael D. Smith Sr. with the delegation from Paraguay. 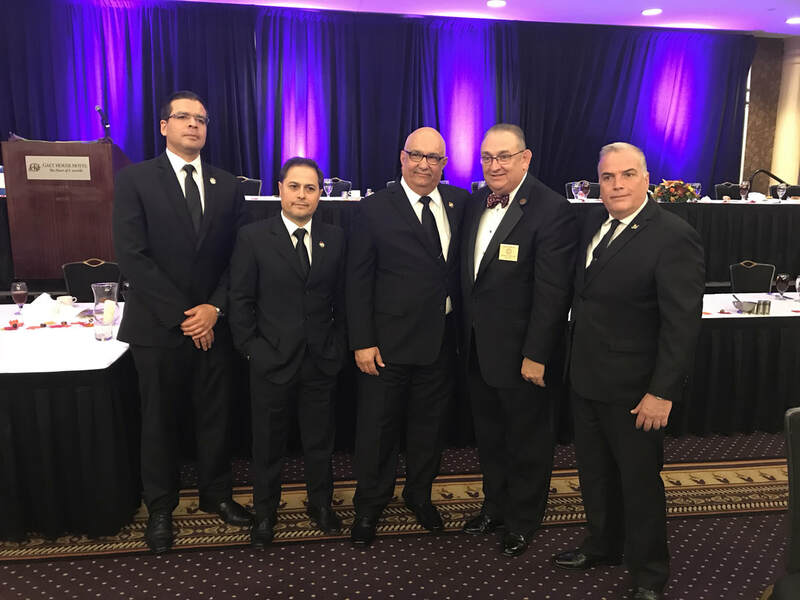 Paraguay received Offcial recognition from the Grand Lodge of Kentucky today. Paraguay had previously received recognition from South Carolina. we began to develop. We were taught to crawl, communicate, to speak, to think on our own, to reason things out and walk out of the darkness. This gift of God to man endowed us with the knowledge of right from wrong, calling mankind out of the darkness to eternal life. We learn things from our family members, friends, acquaintances, and GOD’s great light, how to survive and to develop our spiritual being (soul). Conversely, when we entered Masonry, we needed the same care and teachings to survive. We used our skill and reasoning to come out of the darkness when we asked a Brother how to be a Mason? This desire came only after we observed Masons in our communities, workplaces, churches, synagogues, and houses of worship, demonstrating their dedication to God, Family, Community and the desire to serve mankind in any way they could. Consequently, it is the duty of all Masons to teach, model, instruct and insure each new Entered Apprentice is given all the tools ensuring he can and will build the house of the eternal spirit. We are often reminded of the necessity to continually and carefully study the Great Light of Masonry, the Holy Bible that rules and governs our everyday life and our interaction with all mankind. By being encouraged to continue our study of the Great Light, we come out of the darkness to build our spiritual house, not made with hands. ​Consider the color of the lambskin apron and how the color is to remind us of purity of life, which is one of the characteristics of a Mason. RW Brother Cal, our DGM, has reminded the Craft, an aspirant joins Freemasonry, we do not join him. He is in the dark, he may have no knowledge of the Great Light nor God’s plan for each of us. The aspirant should align with our tenants; however, he must be mentored. Those of us who were blessed by our parents who loved and raised us to be men of faith, men that care for the human race, men that love and obey the Great Architect of the Universe, owe it to be faithful and do the same to those in our circle of acquaintance. As Masons, we should study the Great Light of Masonry, to renew our minds so we can know the will of GOD. Establishing GOD’s word as the authority for our life, is vital for defending against the spiritual attacks seeking to distract, deceive, and waylay our Father’s greatest creation...man. Never forget that without guidance and the proper instruction, we will lose each Entered Apprentice, exiling them to the world of darkness. Thought of the Month: Commit yourself to change the world in small ways by investing yourself into others one life at a time. Word for the Month: Knowledge Facts, information and skills acquired by a person through experience or education, theoretical or practical understanding of a subject.